Ask any new parent and they'll tell you that the onesie is one piece of baby clothes that they can't live without. And this cute baby themed photo frame favor makes the most of this tiny fashion statement! 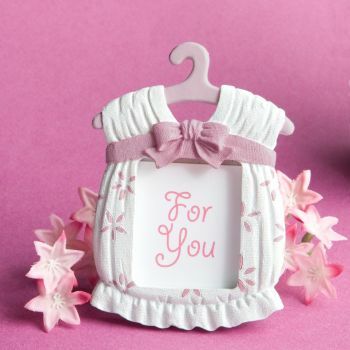 A Fashioncraft exclusive, each onesie frame measures 2 .75" x 3 .75" and is made of detailed pink and white poly resin in the shape of a onesie with a hinge-backed photo window at its center designed to hold a 2" x 1 .5" baby photo or an event day place card. Great as baby shower favors or to send with your baby announcements, each comes packaged in a white box with a pink and white "For You" message in the frame. The photo frames were a perfect size, and fabulous gift. However the color quality (pink) was more lavender color. It stood out on the tables because everything else was pink. I ordered them and received them within a week. Really fast. Thank you!! Cute but much smaller than expected. I loved the item and the quality. I would order from this company again. Cute frame but the color was much darker than the picture, more of a mauve color. These frames were prettier than I expected. Each were securely packaged and they arrived on time. I would use this company again and would recommend others to use them. Fastest shipping ever! Good service! Recommended!!!! I ordered these for a baby shower, I requested a somewhat speedy deliver and Nice Price Favors Delivered. They are beautiful, and I also ordered the convenient boxes. I will definitely use them again and recommend them to family and friends. This one was a nice surprise, everybody like to have one. These photo frame favors are perfect for our baby shower. Very nice quality.Great price also!! Wow these were such a hit at my 1st Granddaughters Baby Shower I put a photo of her at 2 days old I used a wallet size photo trimmed down they really came out so cute.